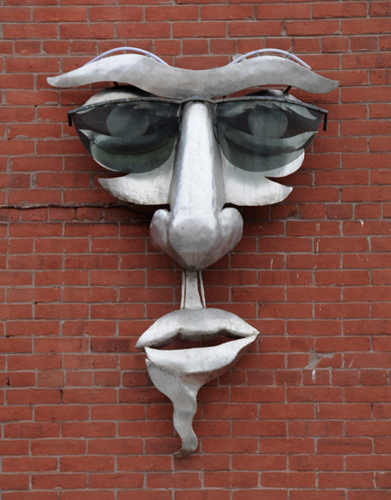 This 6 foot high metal face sculpture is attached to the brick on the second floor of the building located at 1615 17th Street NW, Washington, DC. The sculpture includes silver metal lips, part of a chin, the nose, cheeks, eyes and eyebrows. There are also black metal glasses frames and gray lenses made of plastic or glass. At the top and taking the same shape as the tops of the eyebrows is a line of neon lights. The building is located on the southeast corner of the intersection of Corcoran and 17th Streets NW. The sculpture is on the side of the building facing Corcoran Street. Located on the second floor of 1615 17th Street NW is Dupont Optical. And in the windows of Dupont Optical’s offices are two quite interesting sculptures. 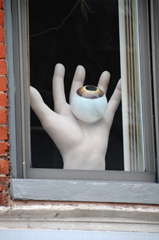 In the window closer to Corcoran Street is a white hand holding an eyeball with a hazel or brown iris. 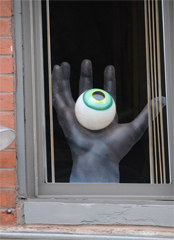 In the next window is a black hand holding an eyeball with a green iris with a touch of yellow toward the pupil. Also located on the first floor of the building is Prego Again. According to the signs in the windows, Prego Again is a gourmet deli with beer and wine available. 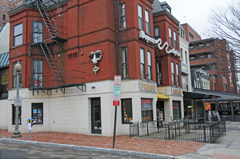 The Metal Face Sculpture is locate on the Corcoran Street side of 1615 17th Street NW, Washington, DC. Click Here for Google Map showing the location of the Metal Face Sculpture. Closest Metro Station: Dupont Circle is the Metro Station nearest to this sculpture. This painting of the White House is on the side of the building located at 2423 18th Street NW, Washington, DC. The building looked unoccupied when this photograph was taken in January 2010. But there were several signs in the front for a previous tenant, Mercedes Bien Vintage Clothing. The image in this wall painting is of the White House from the Pennsylvania Avenue side with fluffy white clouds and blue sky behind. The White House has been painted so that it appears as a postcard or as a photograph with a white border placed against the other images in the mural. To the left of the White House postcard the Washington Monument rises the entire height of the mural which is a little less than halfway up the side of a three story brick building. Three red stars of various sizes fill the lower left corner of the mural. These stars mirror the similar three red stars of the Washington DC flag. The White House Wall Painting in Adams Morgan is on the side of 2423 18th Street NW, Washington, DC. Click Here for Google Map showing the location of this wall art. 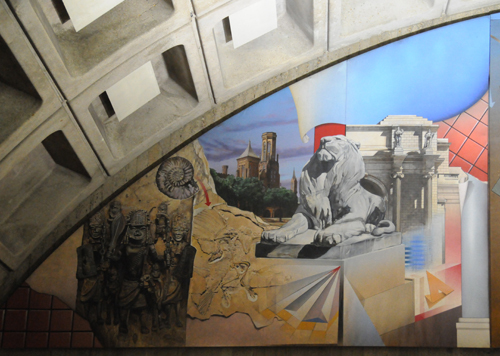 Closest Metro Station: Woodley Park-Zoo/Adams Morgan is the Metro Station nearest to this wall painting. 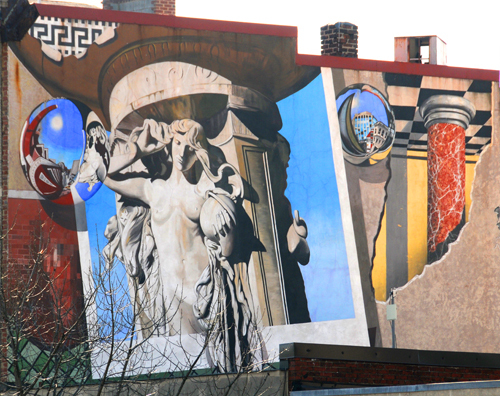 This Dupont Circle Mural is painted in trompe l’oeil style which tricks the eye and gives a feeling of real depth. The three dimensional effect is apparent in the carved figure in the base of the fountain, in the red/orange marble column and in other features of the painting. The carved figure is part of the base of the Dupont Circle Fountain. This same fountain is featured in another work by the same artist, the Metro Center Mural. The spherical mirror in the image below adds to the 3-D effect by reflecting images on what looks very much like a realistic three dimensional curved surface. The buildings of Dupont Circle, the ornate border at the top of the mural and the base of the fountain are all set off against a clear blue sky highlighted by a bright white sun. 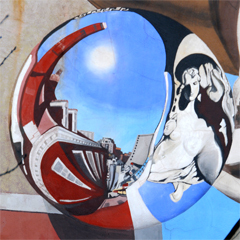 There is a second representation of a fisheye or ball shaped mirror located in the upper right portion of the mural. 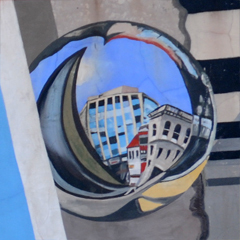 The distorted images of Dupont Circle buildings in the center and on the right are balanced against images of yellow, gray, black and orange that are reflected from the mural itself. 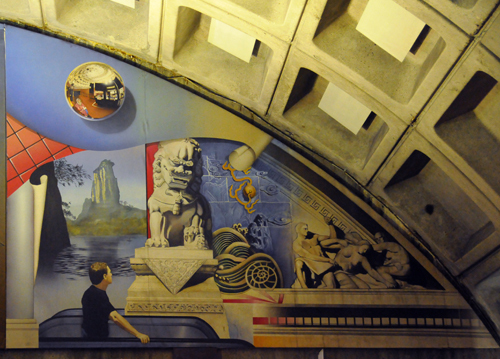 Both spheres serve to join the outer reality of Dupont Circle in the form of buildings and sky with the less prominent painted reality of the mural. This mural as well as the one at Metro Center were both painted by G. Byron Peck who has painted a number of murals in Washington DC as well as others around the world. 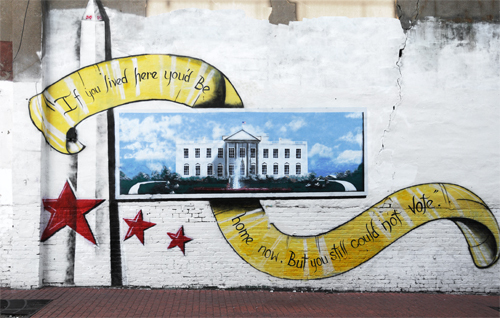 This mural is painted on the northwest side of 1736 Connecticut Avenue NW in Washington, DC. 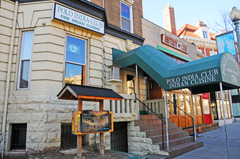 The Polo India Club Restaurant is located in this building. And the mural is above the Bistrot du Coin located at 1738 Connecticut Avenue NW. 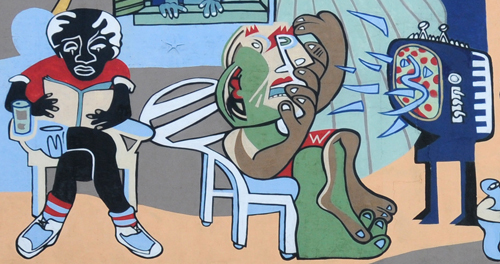 The Dupont Circle Mural by G. Byron Peck is on the northwest side of 1736 Connecticut Avenue NW where Polo India Club is located. The mural is above Bistrot du Coin. Click Here for Google Map showing the location of the Dupont Circle Mural by G. Byron Peck. 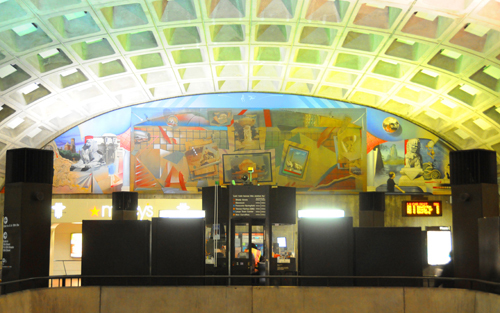 Closest Metro Station: Dupont Circle on the Red Line is the nearest Metro Station to this mural. Salon Roi is located on Connecticut Avenue NW near Calvert Street NW. Roi Barnard thought a portrait of Marilyn Monroe would enhance the third floor side of the building occupied by his salon. In 1980 Charles Stinson hired John Bailey to cover the gray wall with Marilyn’s face. The colors have faded some over 30 years, but the image is still striking. 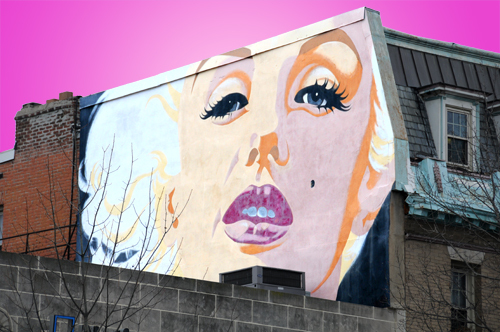 The wall painting of Marilyn Monroe is located on the south facing (toward Calvert Street NW) side of 2602 Connecticut Avenue NW, Washington DC. Click Here for Google Map showing the location of the Marilyn Monroe wall painting. Closest Metro Station: The Woodley Park-Zoo/Adams Morgan Metro Station on the Red Line is nearest to the wall painting of Marilyn Monroe. 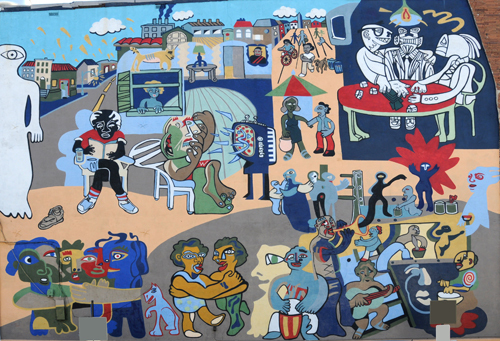 is the oldest and only mural remaining in Adams Morgan created by a group of Latino immigrant artists. It was brought back to life in 2005 by Sol & Soul, a DC artist-activist organization, with the collaboration of artist Jaun Pineda. Sol & Soul thanks Jim Graham, Councilmember Ward One, for helping to make this project possible. We also thank the Advisory Neighborhood Commission IC – Adams Morgan, DC Commission on the Arts & Humanities, and the Mayor’s Office of Latino Affairs for supporting this project. Dedicated to all those who struggled to make – and keep – this neighborhood their home. Dedicado a todos aquellos que lucharon por hacer y mantener esta vecindad su hogar. A People without Murals is a Demuralized People is painted on the side of 1817 Adams Mill Road NW, Washington, DC, the location of Kogibow Bakery and Food. Click Here for Google Map showing the location of this wall art. Closest Metro Station: The Woodley Park-Zoo/Adams Morgan Metro Station on the Red Line is nearest to A People without Murals is a Demuralized People. 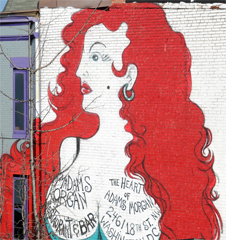 The Red Haired Woman of Adams Morgan is an advertisement for Madams Organ Restaurant and Bar and is painted on the side of the building where it is located. The image is distinctive and easily visible along parts of 18th Street NW. Flashes of this image appear in multiple episodes of Real World DC. This wall art is painted only a few doors away from the cocktail glass light that also appears in multiple episodes of Real World DC. This wall painting and the cocktail glass are located so that they can and do sometimes appear in the same camera shot. Click Cocktail Glass Light to see the StationStart.com entry about that light. The Red Haired Woman of Adams Morgan is painted on the side of 2461 18th Street NW, Washington, DC in Adams Morgan. Click Here for Google Map showing the location of the side of the building where the Red Haired Woman of Adams Morgan is painted. Closest Metro Station: The Metro station nearest the cocktail glass light is the Woodley Park-Zoo/Adams Morgan Metro Station about six tenths of a mile away. Occupying one full side of the building at 1633 P Street NW is a painting depicting characters and more from the Wizard of Oz. This is a graffiti type wall painting that stretches from the front of the building to the back on the side that faces Stead Recreation Center. Actually the wall painting provides a boundary at one side of a basketball court. From the image it may look as though part of the painting is missing, but it isn’t. The painting uses all of the space that is available on the east facing side of the building. The front of the building is at the left edge of the painting, and the painting occupies the entire two stories at that point. The rear of the building is one story, and again the painting uses all available space. The Wicked Witch of the West (portrayed in the movie by Margret Hamilton) is on the far left end of the painting and flying on a broomstick. Further to the right are the Tin Man, Cowardly Lion, Dorothy Gale and Toto (portrayed in the movie by Jack Haley, Bert Lahr, Judy Garland and Terry, a black Cairn Terrier). Above that group is one of the flying monkeys. Toward the center of the painting is Emerald City. And just beyond that is the Scarecrow (portrayed in the movie by Ray Bolger) and another flying monkey. Click Wizard of Oz to see a StationStart.com entry that summarizes information about the Wizard of Oz in and around Washington DC. 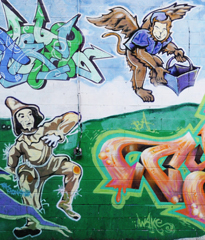 The Wizard of Oz Wall Painting is on the side of 1633 P Street NW, Washington, DC and is visible from Stead Recreation Center which is located at 1625 P Street NW. Click Here for Google Map showing the location of Location of Wizard of Oz wall painting. Closest Metro Station: The Dupont Circle Metro Station on the Red Line is nearest to Stead Recreation Center.